Address: 500 S. Main St., Las Vegas, NV 89135Brunch Hours: 8 a.m. – 2 p.m.MTO Cafe is a favorite DTLV brunch spot for its friendly staff and tempting menu. Popular menu items include breakfast classics like orange juice and pancakes, in addition to lunch favorites like the BLT Chopped Salad and Vegan Falafel Wrap. Got a big appetite? Try the Hangover Burger — an Angus patty topped with bacon and a fried egg. Address: 707 Carson Ave., Las Vegas, NV 89101Brunch Hours: 8 a.m. – 2 p.m.This aptly-named downtown hotspot is beloved by locals and visitors alike for its fresh approach to Sunday brunch. Linger over made-with-love dishes like cinnamon biscuits with strawberry compote and chicken fried steak, paired with fresh-brewed coffee or passionfruit iced tea. You can’t leave this gem without at least trying one of their famously fluffy pancakes, so don’t forget to at least order one on the side. 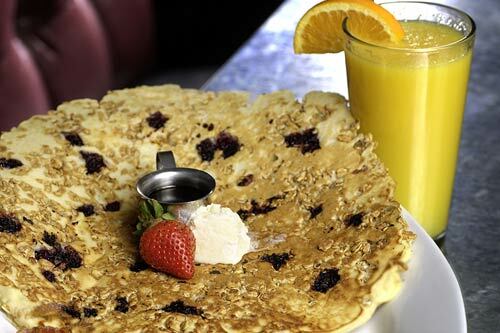 Address: 616 E. Carson Ave. #110, Las Vegas, NV 89101Brunch Hours: 9 a.m. – 3 p.m.Bring your appetite and prepare to fulfill some cravings when you brunch at this buzzworthy restaurant. The focus here is on fresh, seasonal, and locally sourced ingredients. Enjoy Strawberry Cream Cheese Turnovers and Salmon Flatbread for starters, followed by a Wild Mushroom Omelet or a delectable Apple Pie Waffle. The brunch beverage menu includes smoothies, cocktails, and of course, champagne. Address: 1 Fremont Street, Las Vegas, NV 89101Brunch Hours: Open 24/7Du-Pars is a Las Vegas classic, and for good reason. This restaurant is open 24 hours, 7 days a week. Stop in whenever hunger hits to enjoy brunch favorites like buttermilk hotcakes and farm-fresh eggs. Another dish to try is their famous Creamed Welsh Rarebit, served over an English muffin with cheese sauce and bacon. Address: 129 Fremont Street Experience, Las Vegas, NV 89101Brunch Hours: 11:30 a.m. – 11:59 p.m.Indulge in a taste of Italy at the Grotto, where you’ll find delicious menu offerings perfect for Sunday brunch. Classic Shrimp Cocktail with a Caprese salad is always a good choice, especially when enjoyed with a fine Prosecco or Champagne. Address: 707 Fremont Street, Las Vegas, NV 89101Brunch Hours: 9 a.m. – 10 p.m.This trendy Las Vegas establishment has a brunch menu featuring sweet offerings like Brioche French Toast and Monkey bread, along with savory choices like Smothered Egg Biscuits and Chimichurri Chicken Sandwich. Address: 200 Fremont St., Las Vegas, NV 89101Brunch Hours: 7 a.m. – 3 p.m.Stop by Paradise Buffet on Saturdays and Sundays for a champagne brunch with island flair. This buffet-style restaurant serves an impressive array of seafood, including fresh sushi. On weekend mornings, popular dishes include freshly baked muffins, scrambled eggs, and cheese plates — enjoyed with Mimosas, of course. Address: 3645 S Las Vegas Blvd, Las Vegas, NV 89109Brunch Hours: 9:30 a.m. to 1:30 p.m.The only thing this restaurant does is brunch, which is why they’re only open on Sundays. Enjoy a truly luxurious dining experience with menu items like Beluga caviar and lobster tail, with Champagne, naturally. Address: 1 S Main Street, Las Vegas, NV 89101Brunch Hours: 7:30 a.m. – 10 p.m.Signature Bloody Marys and hearty American cuisine is on the menu at Hash House a Go Go, located in the Plaza. Fill up on Buttermilk Flapjacks or a Farm Scramble — fluffy eggs served with meat, vegetables, and cheese. If you’re in the mood for lunch, try a crispy salmon sandwich or one of the establishment’s incredibly fresh salads.